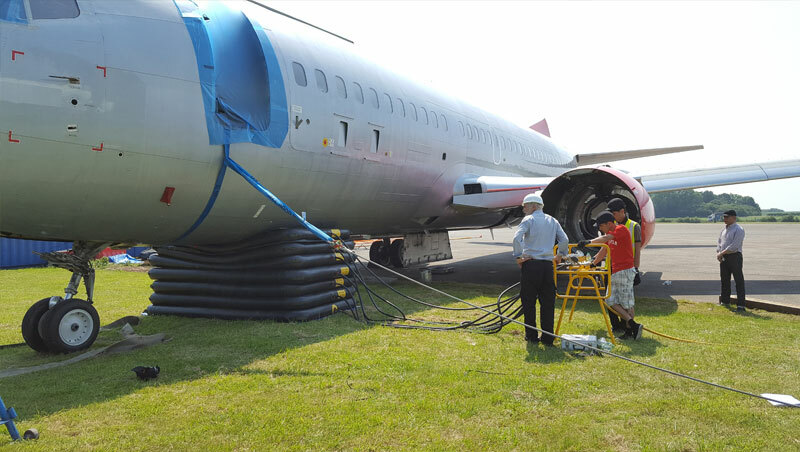 Turkmenistan provides an interesting case study of the type of situation which demonstrates why AMS’s aircraft recovery equipment and training services are being more widely sought. Tourism has grown rapidly in the country in recent years, reflected by the number of airports located across Turkmenistan. Four airports now have international status: in the capital, Ashgabat, and at Turkmenabat, Mary and Turkmenbashi. As air traffic has increased so have the associated risks of aircraft incidents on the ground. AMS were sought out as the airport authority’s provider of choice to address this risk. The subsequent purchase of AMS equipment shows the positive attitude Turkmenistan’s airports have taken to ensure incidents can be dealt with quickly and safely. The growing capacity of the airports required a balance of equipment to handle current aircraft and a degree of future-proofing. The subsequent order therefore included a Full Airbag System, a Narrow-bodied Airbag System, a CAT3 Fuselage Lifting System, two 25t De-Bogging Kits, two 50t De-bogging kits, a run of Synthetic Panels, and Radio-linked Tethering Kits. The purchase was supported by an aircraft recovery training course held at our dedicated facility in the UK for a team of six Fire Crew. 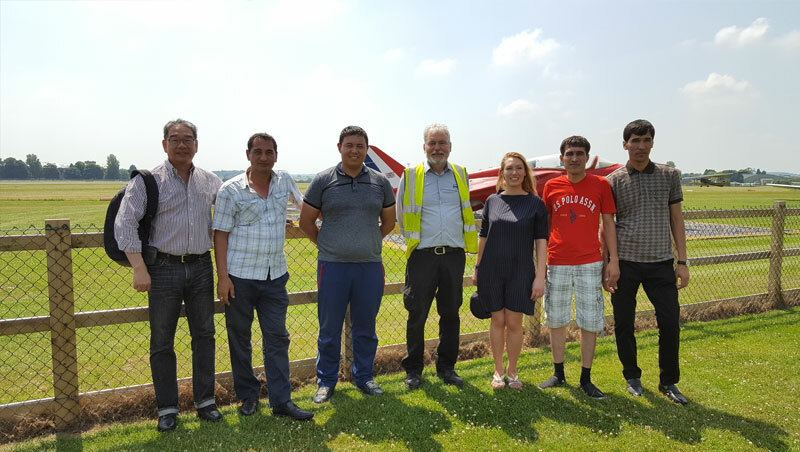 This was the first time we had hosted a team from this part of Central Asia and we employed a qualified interpreter to help with instructing the team during their course (as all the delegates were Russian speakers). The interpreter also helped us to host and look after the course delegates at the hotel used for their stay in the UK. This ensured any questions were fully covered and allowed us to discuss different aircraft recovery scenarios and situations AMS had encountered during our 28 years in business (many of which fall outside most aircraft recovery teams’ knowledge or experience). The interpreter’s services proved invaluable, helping to explain the various recovery techniques, how equipment is deployed, and details and load limits found in the ARD and ARM. She then assisted with translating instructions during a “hands-on” airbag lift of a Boeing 737 to conclude the first day’s training. The second day’s exercises included aircraft tethering and nose lifts of the same aircraft using AMS CAT1 and CAT2 fuselage lifting beams and slings. As the entire Turkmenistan team were Fire Crew we also arranged a tour of the Cotswold Airfield Fire Station, so they could compare duties and equipment with their UK counterparts. This proved to be very popular and is a feature we intend to include for further visits by Fire Crews for future training courses. Airports around the globe now handle higher volumes of flights than ever before. Emerging nations are encouraging more tourism and business travel, established nations are attracting more tourists (often for short-stay breaks), aircraft delivery services have increased as export/import demands have expanded, and there has been a significant rise in the number of major sporting events now held around the world. The risk to airports that do not have access to aircraft recovery equipment is substantial. If an aircraft incident occurs on the runway or taxiway flights have to be diverted, delayed or cancelled. The resulting disruption can be a commercial and PR disaster for countries and regions hoping to encourage more visitors. AMS have been designing, developing, manufacturing and distributing aircraft recovery equipment for 28 years. We are recognised as the provider of choice by many of the world’s airport authorities, airlines and military air forces. You can see from our customer list that we cover a wide range of international airports (both large and small). Our comprehensive range of equipment offers tremendous flexibility, which also allows airports to purchase lower cost Rapid Response Systems as a basic package that can be upgraded as the needs and budget of the airport change. The return on investment is significant. Being “incident ready” ensures the smooth operation of the airport, reduces potential losses in revenue (incurred by diverting flights and paying compensation), and maintains a positive PR profile. You can find out more about AMS’s aircraft recovery equipment by viewing the aircraft lifting and aircraft movement pages on our website. 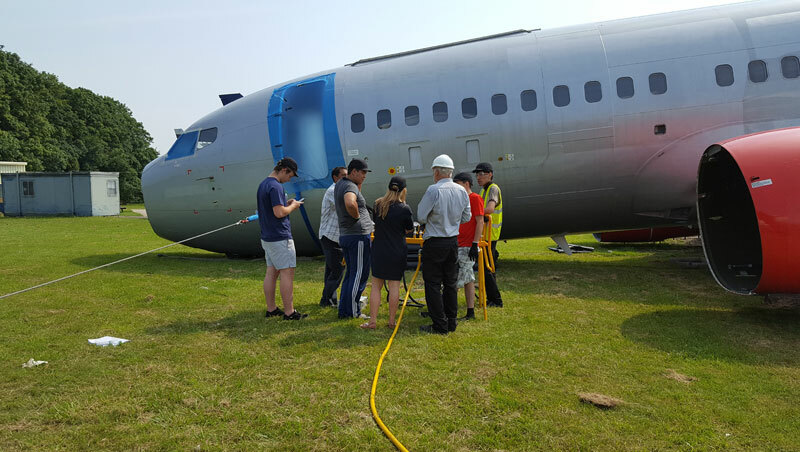 We have delivered high quality training to over 1,150 participants across the world, and now have the capability to expand our Aircraft Recovery Training Courses on a much wider scale, through a new SKYPE option. Our courses are internationally recognised for helping aircraft recovery teams, fire crews, insurance assessors, aircraft engineers, and Operations and Emergency Control Centre staff to understand how aircraft should be recovered, both safely and in accordance with IATA recommendations and the appropriate Aircraft Recovery Manual [Boeing] / Aircraft Recovery Documents [Airbus]. You can view a complete training exercise by clicking here. An overview of our 2 Day and 3 Day Aircraft Recovery Training Courses can be found here. To obtain detailed itineraries for both courses please send our Training Manager, Brian Deacon, an email to brian@aircraft-recovery.co.uk. If you have any questions regarding AMS Aircraft Recovery Equipment or Aircraft Recovery Training Courses please call us on +44 (0)20 3289 9320, or contact us using the form on our website.